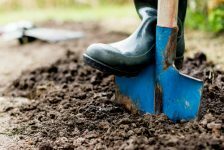 When doing yard work around the house, you may not realize it but there could be underground utility lines on or near your property. When these lines are damaged, it can affect vital services from being connected. It’s important to be aware of the location of these lines to avoid harming yourself or your neighbors. Step 1: Call 8-1-1 to request a locate ticket before you dig. This includes digging on private property, in the middle of a field, on a street with no name or even surface grading. Be sure to be detailed to help locators mark the right areas. Step 2: After you’ve called 8-1-1, you must wait two full business days before digging. Day one starts the next business day. The wait is 10 days if your site is underwater. Step 3: It is the excavator’s responsibility to protect utility marks. Before digging, familiarize yourself with the marks. It is good practice to take pictures or a video of the marks. If your excavation will destroy the marks, use offset marks as a reference point for the utilities. Avoid placing dirt on or driving machinery over the markings so they are visible at all times. Step 4: Utilities use Positive Response to let you know if their lines are not in conflict with your job site, marked or unmarked. The law requires you verify utility responses BEFORE digging. To check the Positive Response system, visit www.sunshine811.com or call (800) 852-8057. Step 5: When digging, please note the tolerance zone is 24” on either side of the marks and the utility can be buried at any depth. Use caution when digging in this area to expose the utility lines. After you find the underground utilities you can use mechanized equipment within the tolerance zone. Digging must be supervised by someone other than the equipment operator. If your work requires utilities to be exposed in large spans, Sunshine 811 recommends supporting or bracing exposed utilities to protect them from moving or shifting. Remember, make the call, it’s the law.